I've been making pimento cheese for a long time, and actually have stuck to one recipe I got courtesy of Jim 'N Nick's BBQ at a Big Apple BBQ Block Party back in 2011 that hasn't left me any reason stray. The only thing I've changed up is using fresh red peppers that I char, peel, and then dice, instead of jarred pimentos. I didn't think this would make a big difference at first, but it does deliver an intensity of bell pepper flavor that canned can't match, so I think it's worth taking the little extra effort roasting requires. Other than the pimentos, the spread is made up of grated cheddar, mayo (preferably Duke's), hot sauce (I use Texas Pete), and cayenne. The end result is one of the finest pimento cheeses you'll ever taste, with the familiar creamy and slightly sharp cheese flavor backed by sweet peppers and then given a little kick of heat, which is really the part that I think makes the recipe as great as it is. 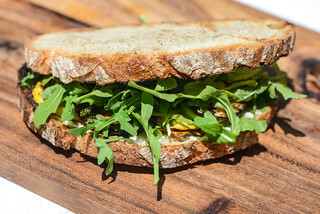 Since this was the only vegetarian main dish I was making for the day, I was extra picky with everything that would make up these simple sandwiches to ensure they would be the best they could be. That had me getting one of my favorite white sandwich loaves from my local bakery, Gughupf. 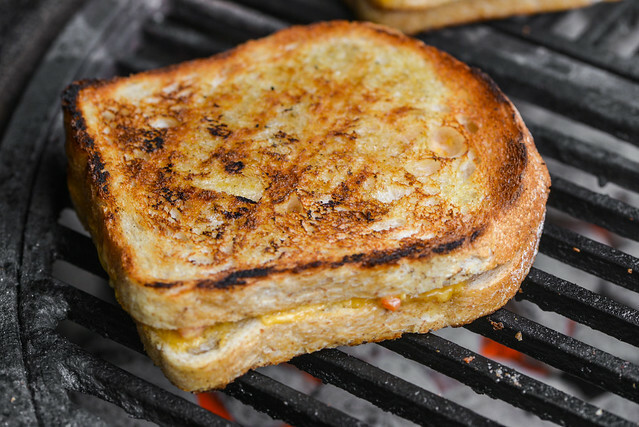 While I think plain old white is the bread of choice for these grilled cheese, a quality, hearty loaf will output superior sandwiches in the end. To make the grilled cheese, I buttered one side of each slice of bread, and then spread on a generous layer of the pimento cheese. Next, I put the assembled sandwiches on the grill. I utilized a two-zone fire here, with all of the coals situated on one side of the charcoal grate. I then placed the bread close to, but not directly over, the fire. 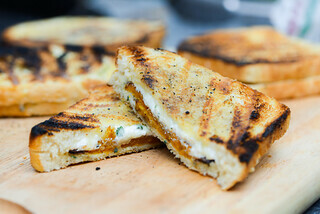 My goal was to try to melt the cheese and get the bread browned and toasty at the same time. Which ended up working out really well, with most of the sandwiches being perfectly done after about five minutes, with me flipping them at least once during cooking. 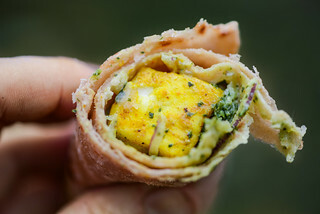 Those sandwiches that weren't quite browned to my liking, I quickly gave more color by moving them directly over the coals, which got them golden very quickly, sometimes a little too quickly though...keeping a watchful eye to prevent over-charring is a must. Once off the grill, I sliced the sandwiches into triangles and served. Just look at that melted amazingness above, how could anyone resist that? 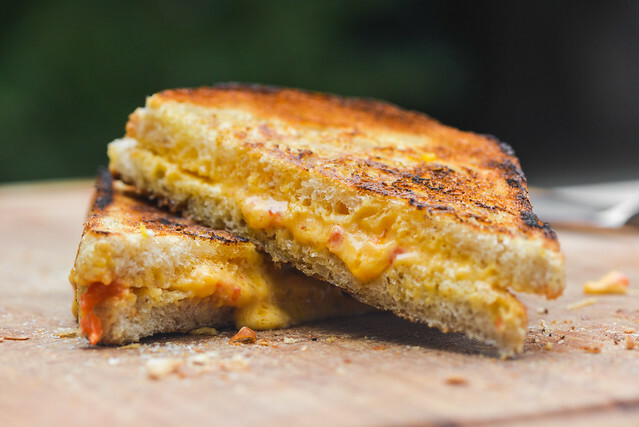 These were everything a great grilled cheese should be—crunchy, buttery, gooey, cheesy—but with an added richness and flavor brought by the pimento cheese. My main problem at the end of the day was not about anyone caring that these didn't really fit into the theme, but all guests—meat eaters and not—wanting in on the sandwiches without quite having enough bread on hand to really feed the entire crowd. 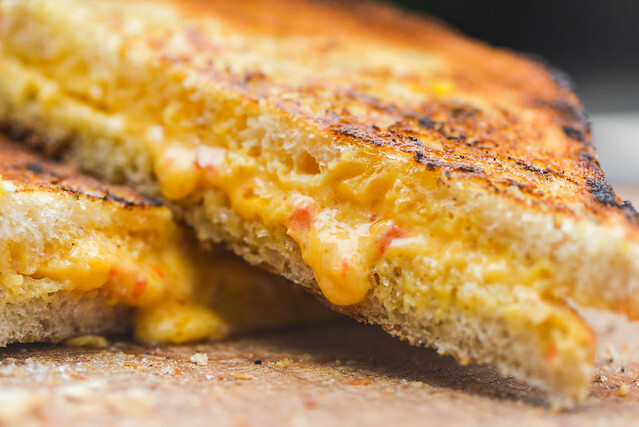 A great grilled cheese gets even better by using rich and flavorful pimento cheese and being cooked on the grill. 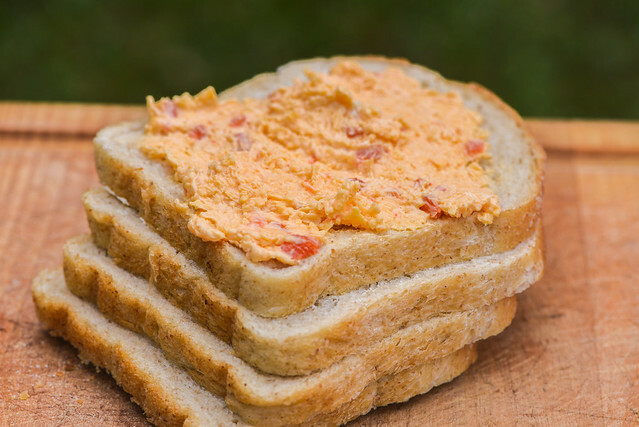 To make the pimento cheese: Roast pepper over gas stove, grill, or broiler until skin is completely charred. Place in a bowl, cover with plastic wrap, and let sit until cool enough to handle, about 10 to 15 minutes. 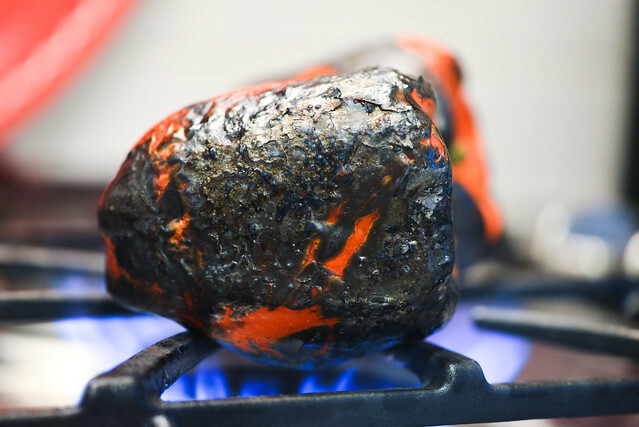 Remove the charred outer skin, cut in half and remove the seeds and core. Finely chop pepper. In a medium bowl mix together cheese, mayonnaise, pepper, hot sauce, and cayenne. 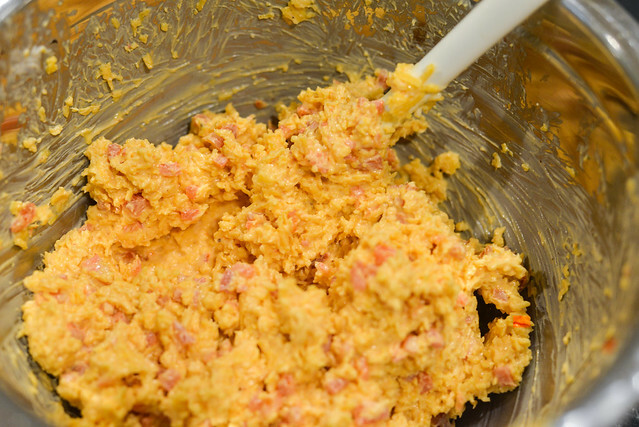 If not using immediately, store pimento cheese in an airtight container in the refrigerator for up to a week. To make the sandwiches: Light one chimney full of charcoal. When all the charcoal is lit and covered with gray ash, pour out and arrange the coals on one side of the charcoal grate. Set cooking grate in place, cover grill and allow to preheat for 5 minutes. Clean and oil the grilling grate. 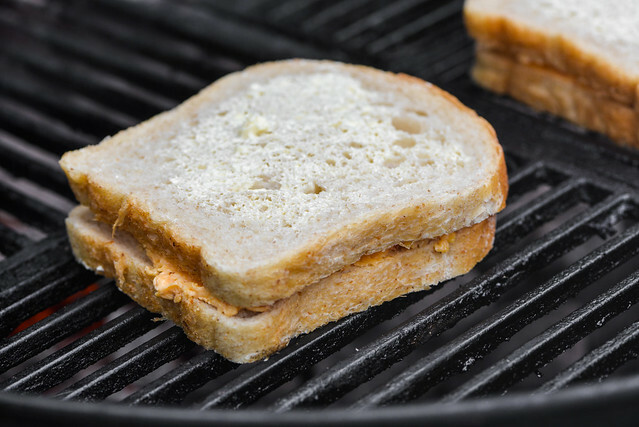 Butter one slice of bread, place non-buttered side up, and spread on a generous layer of pimento cheese. 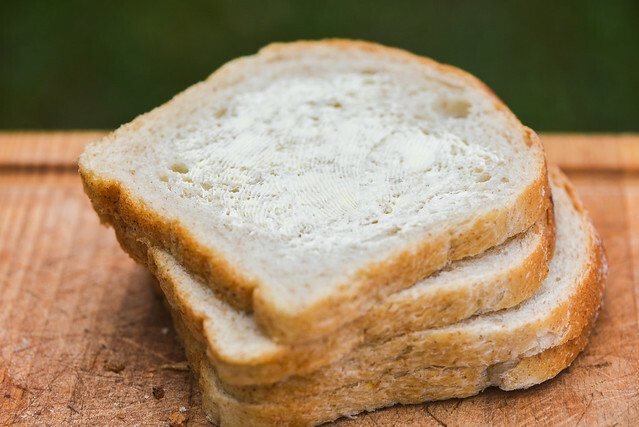 Place a second slice of bread on top and butter. Repeat with remaining slices of bread.